Way, way back in 2010, I believe it was, I attended my first SCBWI writer’s critique group meeting in Bedford, NH, where a bunch of fellow children’s writers gathered each month to share their work and get feedback. I was one of the few who wrote primarily in rhyme and the only one who wrote poetry on a regular basis, so it was interesting to see all the other genres that were presented each month. 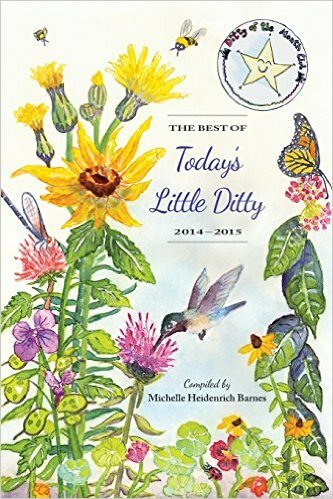 It was there that I met many wonderful, talented folks who helped me, encouraged me, and critiqued me (well, my writing, anyway)…and one of those folks has gone on to have her own poem published in a brand-new anthology! How did the concept for the book come about? An Assortment of Animals : A Children’s Poetry Anthology, published by The Writer’s Loft Press in Sherborn ,Massachusetts, spotlights the imagination and creative works of accomplished writers Jane Yolen, Brian Lies, Josh Funk, and many other talented and gifted writers and illustrators. Kristen Wixted, the editor, pitched the idea for a poetry anthology about animals at one of The Writer’s Loft’s Board of Directors’ meetings. Heather Kelly, the President of the Loft, loved the idea and agreed to co-edit the literary project with Kristen. With the assistance of Sally Hinkley, another board member, the search for writers and illustrators became a reality. From barracudas to flamingos, pangolins to grizzly bears, anteaters to wolverines, and the list goes on and on, our anthology celebrates the joys of poetry and the love of animals for children. The Writer’s Loft is a non-profit writing community dedicated to supporting, encouraging, and assisting writers and illustrators on their creative journey. How did you come to be involved with it? As a member of The Writer’s Loft, I had received information about their newest anthology contest seeking poetry about animals. Having taught kindergarten and first grade for many years, and as a grandmother of five, I knew first-hand how much kids loved poetry and animals. And I wanted to try to be a part of their newest venture. I had entered their first anthology contest a few years ago when they sought stories centering around events happening for the first time. I entered a story about my grandson losing his first tooth. And I was delighted The Wiggly Tooth became one of the stories in their Firsts anthology. What made you decide to write about wolverines, of all animals? I wanted to write about an animal that I knew nothing about. So I perused one of the Wild, Wild World of Animals encyclopedias and came across the wolverine. And I wanted to learn more about it. It is a scary little creature with a big impact. After a few revisions in different forms of poetry, I decided to write an acrostic poem. They are challenging to create as you attempt to match the animal’s features with the letters of its name, but well worth the try. Have you written much poetry before this? I wrote a lot of acrostic poetry with my students. I also gave acrostic poetry as gifts to teachers and family members, using their name and identifying their attributes. I find it fun to write. Did this project give you inspiration for any new projects? I am always working on a new story. And getting published is certainly an inspiration to keep on writing! Congrats again to Elaine and all the contributors! The anthology is available through Amazon, Barnes and Nobel, and Indiebound and can also be purchased in many independent bookstores in The Writer’s Loft area. Check out their website for more information. My Round Two competitor, fellow children’s author Lori Degman, and I now get to try to write poems using the word “oblivion” (our poems needs to be written and submitted by this Sunday morning) so my weekend schedule is now officially blocked out! Log on to register, and get ready to vote Sunday morning! I love that she didn’t do the old, “Write what you know.” She researched a new topic, and the result is this great poem full of imagery. Her words make you almost feel the bite of the wolverine. I look forward to reading more from the collection. Congrats on the move to round 2! I look forward to seeing what both you and Lori do with oblivion. 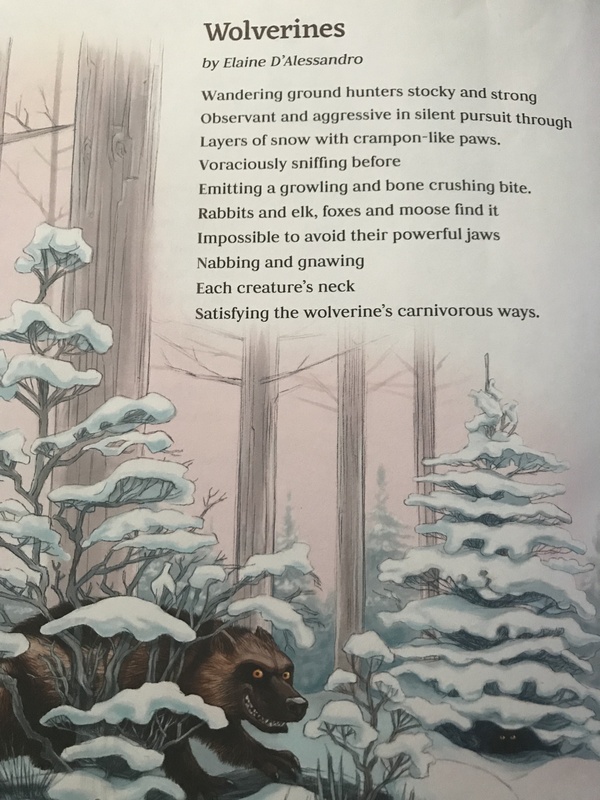 Wolverines are frightening animals, will make a good addition to this anthology for kids! I imagine they’ll love learning from the poem. Congrats to Elaine & to you for Round Two of Madness Poetry, Matt! Very cool! Another book I would love to add to my collection. Congratulations on your success in Poetry Madness. I have fond memories of the first years of the competition and the thrill of moving forward in the brackets! The writing is intense, but I think I wrote some of my best poems for the competition. Thanks, Mary Lee! Second Round voting just opened up, so I’m hoping I can continue moving forward – although Lori’s poem is very good! Yay for critique groups, animal poems, and round two! I just went to the site and saw they won’t be up until 10. Looking forward to seeing what you did with “oblivion”! Thanks, Tabatha – they’re all up now, so I hope you’ll check them out! This book looks amazing! I look forward to reading it. The Wolverine was such a great choice, because other than Marvel, I don’t think kids know much about it. Congratulations to Elaine! And congrats to you for moving to round 2, your poem was great! Thank you for introducing me to this book and to Elaine’s terrific poem. She’s correct, kids do love poetry and animals! Also, good luck with your poem!